My morning iced tea, because it's National Iced Tea Day, Dynamos! What? 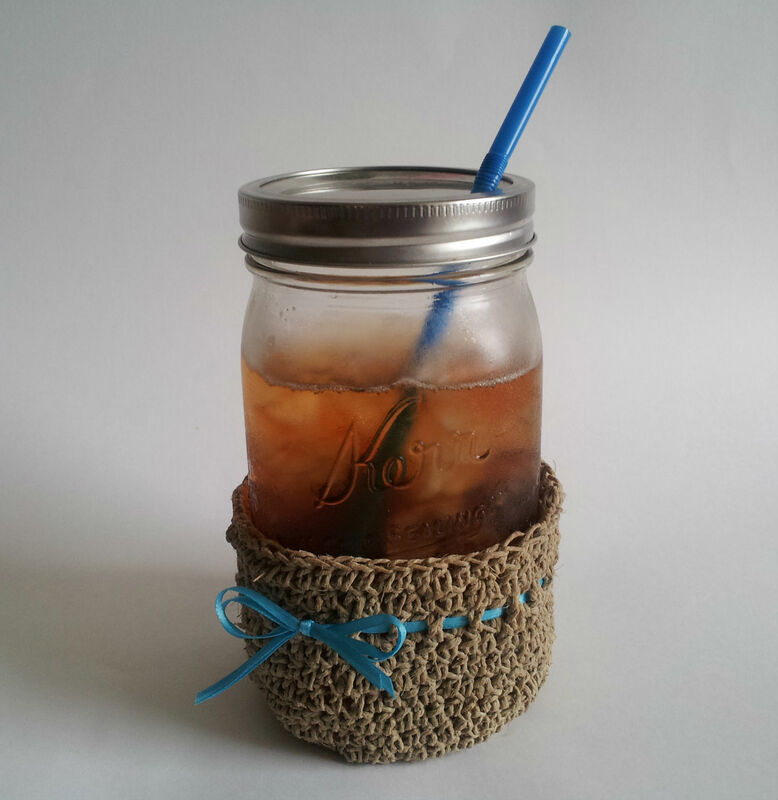 You did not know that iced tea is the official beverage of CrochetDynamite.com? It's true. I'm obsessed with it. The cool part about my obsession is that I want you to be obsessed too! So I made you a present! Fold the ribbon in half, and use your crochet hook to weave the doubled ribbon through the posts of the dc row (R13). Tie in a bow! Trim the ends so that they look cute. You can run a match, or lighter, over the cut edges to seal them so that they won't fray. Crocheting with hemp is not like crocheting with cotton or bamboo fibers. It's rough. Your stitches won't be even. The thread/cord itself isn't smooth and even. It smells like hay. It's really stiff. BUT, it looks super cool. The uneven stitches make it look handcrafted and expensive. It smells like summertime. Just use some hand lotion afterwards and you will be good to go. Using a quart sized mason jar, add 3 tea bags to 2 cups of water, plus a pinch of baking soda (! I know, right?! The baking soda keeps it from tasting bitter! But only use a tiny pinch, a little goes a long way. Try it, it's amazing) . Microwave on high for 2 minutes. Let it sit an additional 2 minutes in the microwave to steep, so you don't burn your fingers. Pull it out very carefully. Discard the tea bags. Add ice to fill the mason jar. Add additional water to fill jar to the top if necessary. Put your lid and your jar cover on, and you're good to go for the day! Have a really, really awesome Iced Tea Day!! Love this idea! Found you on Craftgawker and I'm definitely going to try this out! Thanks for sharing!! Hi Belinda! I'm so glad you stopped by! If you'd like to, you should totally send me a picture if you make one. I'm putting together a pattern gallery for Dynamos to show what they've done with my patterns. Love it! very cute@ I am gonna try this for my big fat iced tea glasses. I may have to modify the pattern a bit, but it will be great. Thanks! Hi Robbie! The pattern is super simple, it would be really easy to modify. Thanks for checking it out! I LOV EARL GREY ICE TEA! I just seen this, Oh how cute..